In karate circles both in Japan and abroad the so-called Tomari-te has become a topic of great interest in the recent decade. As had been pointed out recently, today there are a lot of genealogies of schools claiming Tomari-te heritage. Yet, since such genealogies sometimes merely seem to serve the purposes and interests of the school in question, they can often not be expected to constitute objective descriptions of actual historical fact. But besides oral tradition and home-brewed genealogies, what is the actual history of sources on the so-called Tomari-te? It should be noted that Motobu Chōki is one of the best known disciples known to have trained directly with Matsumora. One of the earliest written uses of the designation “Chatan Yara no Kūsankū”, by Nagamine, 1959. 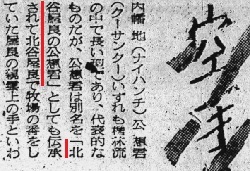 Later, in a newspaper article of 1959 Nagamine explains about Rōhai and Chintō of Tomari provenance, as well as about Matsumora Kōsaku. As a side note, in the same article series Nagamine also uses the designation Chatan Yara no Kūsankū. This is one of the earliest instances of this name found in writing. In 1970 followed the publication of Matsumura Kōshō’s research on Matsumora Kōsaku, whose grandchild he was. Nagamine sensei is listed here as a contributor of information. From one of seven artciles on Matsumora by Nagamine Sensei, 1979. Within the chronology of reasearh publications, it was only in 1979 that Nagamine sensei published a whole series of articles about Matsumora Kōsaku. It appears that only at that time he was able to provide the fruits of his long lasting research into this topic. It is here that we find all those hero stories of Matsumora that today every child knows, like nightly training at the graveyards or when Matsumora encountered and killed a Satsuma samurai. It is also from the above research and publications that we first learned of Matsumora’s first teacher as Uku Karyū 宇久嘉隆 and his second teacher as Teruya Kishin 照屋規箴. This is the basis of all Tomari-lineages ever since. Note that the very name Kōdōkan 興道館 is headed by the character Kō 興, which was the first character used in the personal names of the Yō-clan, to which Matsumora, Iha, Oyadomari Kōkan and many other persons of Tomari belonged. As regards Iha Kōtatsu, in Nagamine 1975 book “The Essence of Okinawan Karate-dō” a little more info is found about this. Iha Kotatsu as identified in OKKJ 2008. The last sentence is not entirely correct, since Matsumora’s proven students such as Motobu Chōyu, Motobu Chōki, Yabu Kentsū, and Kyan Chōtoku were still alive at that time. Besides, previously mentioned Shimabukuro Tarō (see also here), a long time training partner of Nagamine sensei, had also studied under the same Iha Kōtatsu, from whom Shimabukuro learned Wankan, Rōhai, and Wanshū as skills handed down in the Tomari region. From the above alone it might be said that the Tomari-share among the kata of Matsubayashi-ryū possess a uniquely strong Tomari-te lineage above reproach. That is, Wankan, Rōhai, and Wanshū, as well as Passai and Chintō. Since Iha Kōtatsu acted as the karate instructor of the Tomari Student Council, and since he is mentioned as the crucial Tomari-lineage-hub in many other lineages of today, he appears to also have given rise to other traditions. In the future, I hope to hear more about these traditions and see more of their techniques. Until that time, I took the freedom to take a close look at the origin of the person Iha Kōtatsu. In order to do so, I translated the original Ryūkyū kingdom-era “Genealogy of the Yō-clan, House Iha” from Tomari. In it is found in the 13. generation one Kōtatsu of the House of Iha. His childhood name was Tarugani 樽金 and his Chinese-style name Yō Eishō 雍永彰. He was born born 1873-06-21 as the fourth son of father Kōboku 興睦 and mother Umitu 思戸. Born 1672-02-24 as the third son. 1755-04-08: Serves on duty for the reception of returning China-ships (唐船). Reached Iheya Island on 05-08. After the government business was completed, he returned to the capital (to Okinawa) on 1755-09-17. Born 1851-03-24 as the first son. Originally he was the oldest son of Iha Chikudun Pēchin Kōhō (Yō Shintatsu) 伊波筑登之親雲上興峯 (雍振達) and mother Makatu 眞嘉戸, the daughter of Arime Chikudun Pēchin Kentei from the Yō-clan 葉氏有銘筑登之親雲上兼定. Since his uncle Iha Chikudun Pēchin Kōshi (Yō Shinki) 伊波筑登之親雲上興址 (雍振起) had no successor, he was designated his heir on 1867-03-09. This entry was posted in Genealogy Studies, Unknown Ryukyu and tagged Iha Kotatsu, Matsumora Kosaku, Motobu Choki, Nagamine Shoshin, tomari-te. Bookmark the permalink.